Kegel balls are built for pleasure and to strengthen pelvic muscles which leads to stronger more intense orgasms. 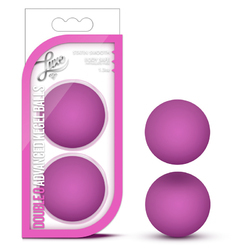 Made of silky smooth body safe ABS plastic each ball contains a weighted bead that cause organic vibrations with your movement stimulating and massaging you. Includes user manual. Each ball measures 1.3 in. diameter and weighs 1.3 oz.